Take a deep breath of crisp, golden, sunlit morning air. Aire-Master’s fresh fragrances will wake you up to a soft blowing coastal breeze — bringing with it the light, crisp scent of a nearby forest floor. Smell the wet dew on an open window pane as the soft glow of the morning sun filters through clean linens drying on the line. Take a deep breath, slide out of bed, and drink it all in! A fresh, clean breath on a mountainside of green and woods. Top notes: fresh, clean, ozonic. Middle notes: crisp and green with woody nuances. Base notes: sweet and musky with floral undertones. Stroll through a thick forest of dew-kissed foliage and clean air. Top notes: fresh and citrusy. Middle notes: clean and green. Base notes: warm and herbaceous with floral highlights. Clean, zesty mix of bright citrus and earth florals. Top notes: fresh, clean, crisp. Base notes: woody floral undertones. 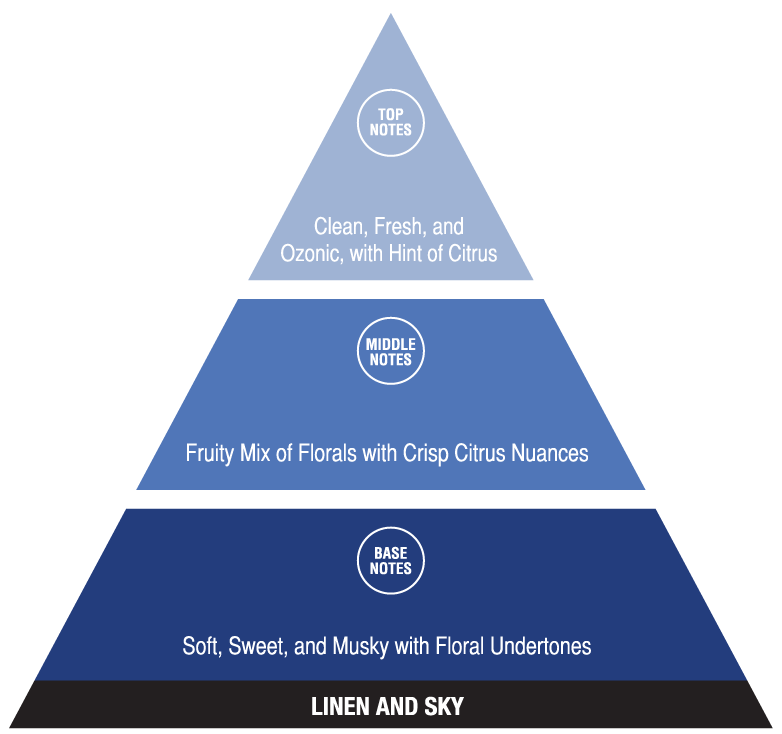 Fresh linen with clean citrus top notes. Top notes: crisp, fresh cotton linens. Middle notes: ozonic, calming watery floral. Base notes: green florals, creamy woody. A bright mix of florals softly kissed with mint and citrus. Top notes: Fresh and clean. Middle notes: Mixed fruity florals with leafy nuances and hint of citrus. Base notes: Sweet and musky with warm herbaceous nuances and musky undertones. Refreshing romp through cool leafy herbs highlighted with sweet sandalwood and soft florals. Top notes: spicy, warm, and clean. Middle notes: green and woody nuances with hint of citrus. Base notes: sweet sandalwood with musky undertones and hint of soft florals. Blend of fresh florals and crisp breezy greens. Top notes: fresh, clean leafy florals. Middle notes: crisp and green with floral blend and touch of mint. Base notes: sweet and soft florals with a mellow, musky undertone. Crisp, leafy florals with touch of mint. Top notes: clean and cooling and minty. Middle notes: intense green with leafy nuances and wintergreen. Base notes: herbaceous and musky undertones with warm nuances. Fresh outdoors set among citrus, wintergreen, and florals. Top notes: fresh, clean, and ozonic. Middle notes: intense green with leafy nuances, hint of citrus, peppermint, and wintergreen. Base notes: warm herbaceous with musky floral undertones. A zesty breeze of citrus of wintergreen and soft florals. Top notes: citrus, cooling, ozonic. Middle notes: florals with sweet wintergreen and citrus highlights. Base notes: herbaceous, woody, and warm with musky and floral undertones. Warm blend of spice and rich spruce with touch of sandalwood. Top notes: spicy, warm camphoraceous. Middle notes: Leafy, woody nuances, fir needle and rich spruce. Base notes: warm woody undertones, sandalwood and patchouli. A fresh, clean scent with floral and citrus tones. Middle notes: crisp and green, with a hint of citrus peel. Base notes: smooth, musky floral undertones. Fresh, clean medley of citrus and cool kiss of pine. Top notes: clean, fresh, citrus zest. Middle notes: tart lemon, green pine needle. Base notes: seamoss, amber, warm cedar. Mild green fragrance with crisp, clean top notes and soft, woody undertones. Sweet, fresh florals and fruit supported by the soft warmth of musk. Top notes: fresh, clean and ozonic. Middle notes: green floral and herbaceous. Base notes: soft musk with woody undertones. A perfect mash up of cooling citrus and sweet, leafy florals. Top notes: clean, cooling citrus. Middle notes: green floral with leafy nuances. 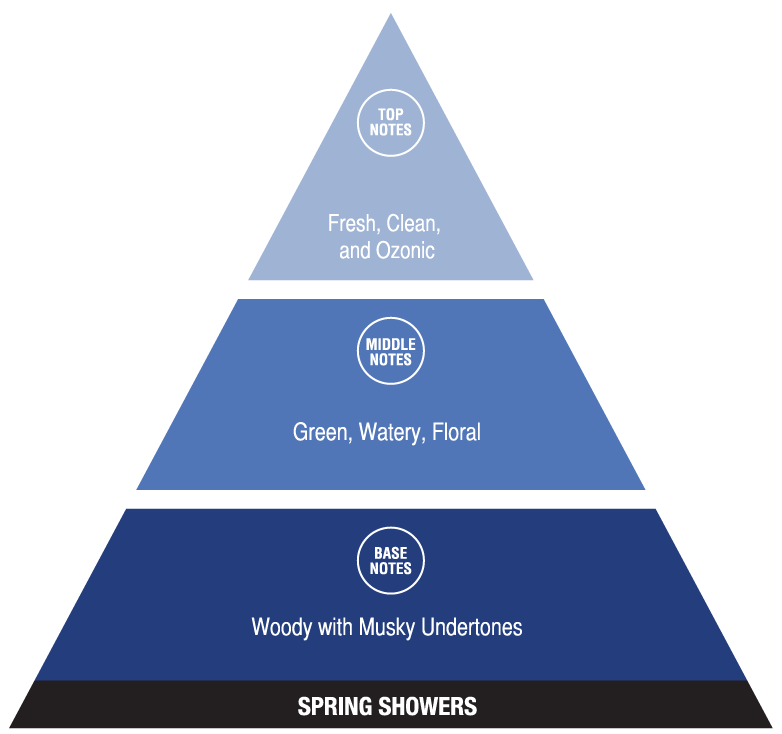 Base notes: woody with warm, musky undertones. A serendipitous, clean blend of outdoorsy goodness. 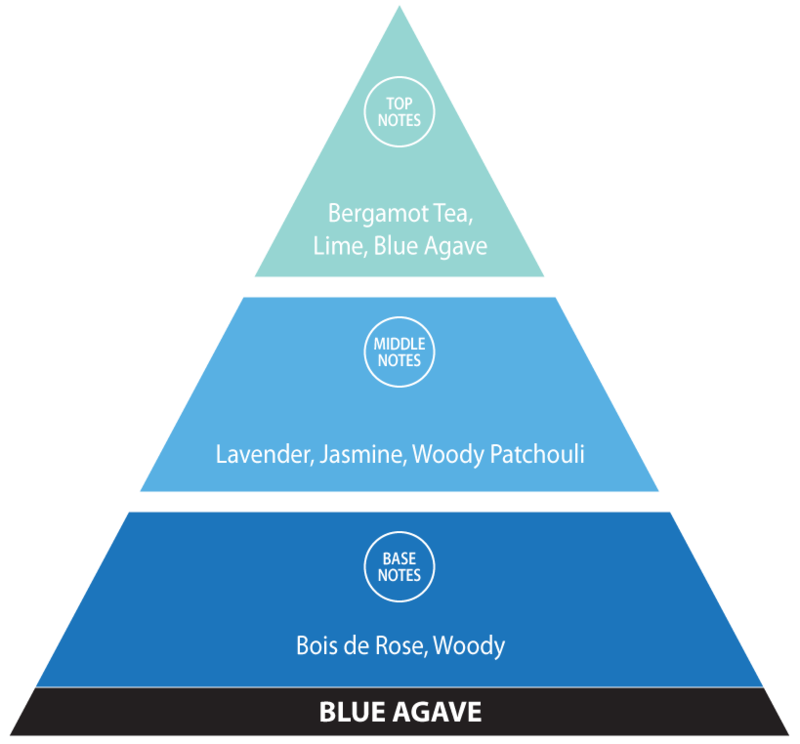 Top notes: fresh, crisp, fir needle. Base notes: woody, musky with mossy undertones. Middle notes: intense Leather aroma. Base notes: sweet amber with carmellic undertones. The sensation of being outdoors with soft, fresh, clean hints of florals and crisp citrus. Top notes: clean, fresh, and ozonic, with a hint of citrus. Middle notes: fruity mix of florals with crisp citrus nuances. Base notes: soft, sweet, and musky with floral undertones. Perfectly balanced mix of crisp, leafy florals and sweet cedar. Top notes: green, leafy, crisp. Middle notes: flowery with mild ginger. Base notes: sweet cedarwood and musk. A zesty blend of citrus and bright florals with a kiss of honeysuckle. Top notes: bright citrus, fresh, green. Middle notes: lily, neroli, honeysuckle, rose. Base notes: orange blossom, vanilla, musk. Hillside meadow of florals and fresh greens with a subtle blanket of fruit and cucumber. Top notes: fresh, hint of cucumber. Middle notes: mixed fruit and florals with intense greens and touch of watermelon. Base notes: sweet musk and warm herbaceous with floral tones. Breezy outdoor getaway among fresh spice, leafy foliage, and soft florals and fruit. Top notes: spicy, warm, and fresh. Middle notes: leafy, woody balsam with hint of fruit, citrus, and floral nuances. Base notes: sweet, smooth patchouli, and musky with mixed berry undertones. Fresh and fruity with a citrus blend of soft florals. Middle notes: green, citrus and fruity. Base notes: floral blend of rose and jasmine. Deep, clean blend of ocean mingled with drift wood and sea moss. Middle notes: salty, sweet floral. Base notes: smooth musk with mossy undertones. A clean, fresh stage of fruity florals with a backdrop of musky wood..
Base notes: soft musk and woody. Fresh and lean greens and florals with woody nuances. Middle notes: green, watery, floral. Base notes: woody with musky undertones. A deep cleansing breath of sweet florals and mixed fruit. Top notes: clean and fresh with cucumber. Middle notes: mixed fruit and florals with hint of watermelon and citrus. Base notes: smooth, sweet, and musky with floral undertones. Bright citrus and florals blend into a smooth woody base. Top notes: citrus, lemon peel. Middle notes: floral, jasmine blossom. Base notes: woody with smooth musky undertones.